Calling back to Computex, ASUS first announced a new Transformer device based on ‘Intel’s Next Generation’ processor. 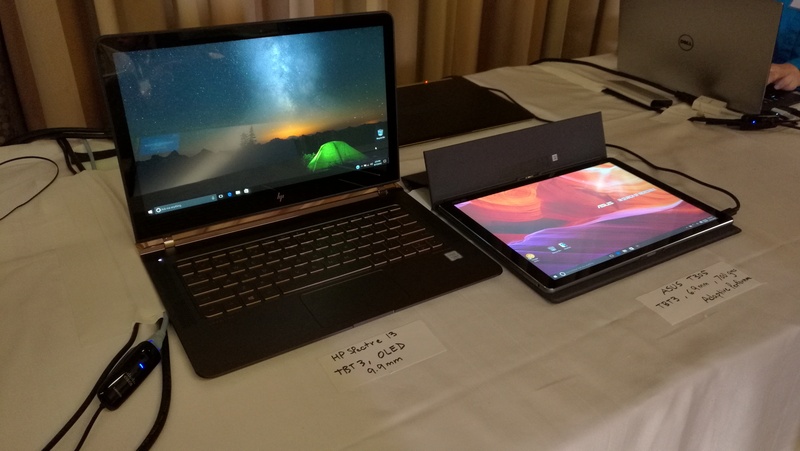 We knew it was Kaby Lake, but given the launch cycle for KBL it was understandable that the device was still a couple of months out and a work in process. At that point of the game the hardware specifications are typically squared away, and final touches are being made to the design ID as well as strong work on the software platform and ramping up the manufacturing aspect. 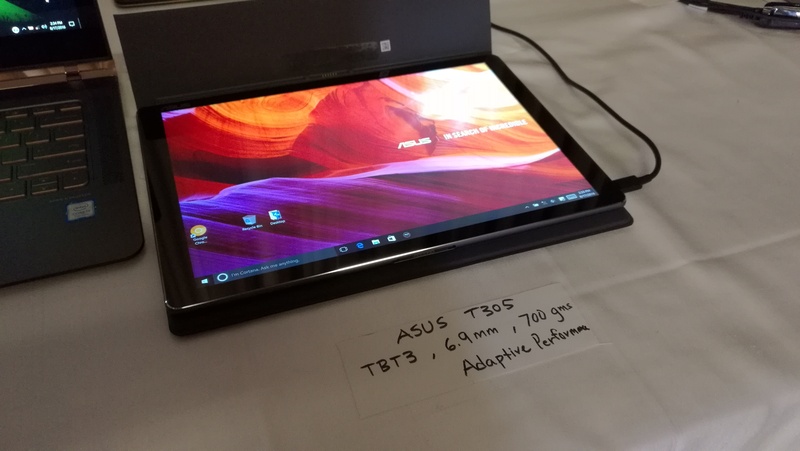 We expect ASUS to launch their new Transformer products in due course. 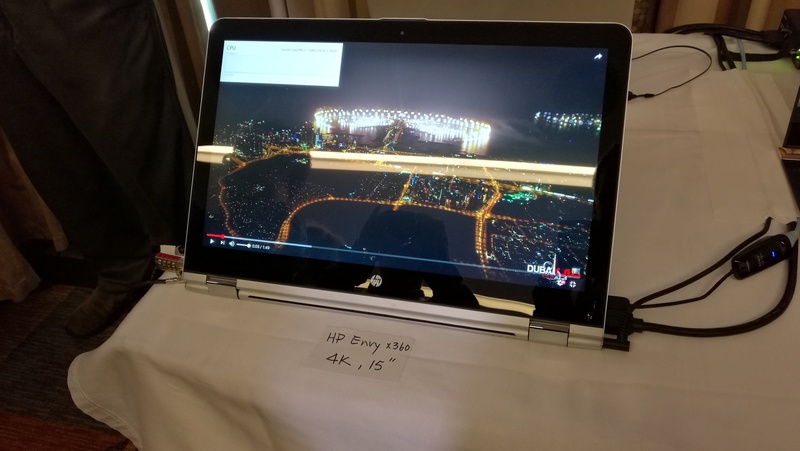 At Intel’s pre-briefing for Kaby Lake, several systems were on display from HP all using the new processors. Specifications were not discussed, however devices with 4K panels and a variety of sizes were shown, including what looked like an upgraded Spectre, as well as a notebook with an OLED display. For the majority of enthusiasts, PC builders and gamers, questions about the time frame of the desktop processor launches, the benefits they bring and the pricing are swirling around the zeitgeist. Intel has confirmed with today’s launch that a wider array of Kaby Lake parts will be launched in January, including Iris graphics enabled processors, desktop parts, enterprise parts and workstation SKUs (vPro and Xeons, one would assume). 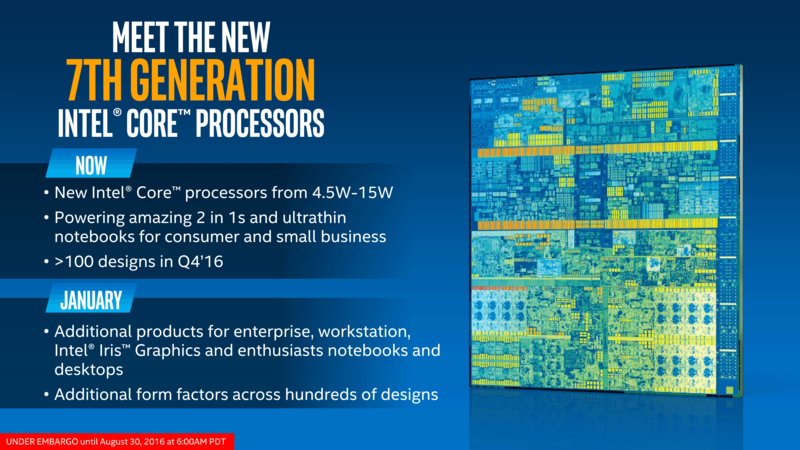 Despite the fact that this is still 14nm, one could assume that 14nm+ was focused on the small die parts first to improve yield before the larger desktop parts were produced, depending on how difficult the shift from 14 to 14+ actually was. There’s also the consideration about Intel’s product lines: Skylake on the desktop was only launched 12 months ago, and the next generation 10nm Intel product is - admittedly looking into a very foggy crystal ball - over a year away and will be mobile focused again as smaller dies are easier to make. Intel has to sufficiently space out its product stacks to ensure maximum profit, appease shareholders, but also give their customers a regular, expected update cycle. There’s a reason we don’t see the best product Intel could ever make on day one at unlimited expense. Given that Intel has said that KBL is a similar IPC to SKL, it might be a bit worrying if desktop performance of the new parts is identical to the old ones, merely bumped up in frequency. Typically a small frequency bump mirrors a basic overclock; importantly however, if the pitch has been widened to allow a higher frequency, this could have a beneficial knock on effect for overclocking. Despite marketing efforts, Intel still limits overclocking to the two high-end SKUs, so how well Kaby Lake overclocks could prove important with desktop enthusiasts. If it overclocks better than Skylake, then we might be looking at the Skylake equivalent of the Haswell Refresh/Devil's Canyon. However if KBL offers the same OC frequency as SKL, and the same performance due to a similar IPC, then enthusiasts might not be interested. Ultimately Intel is going to market the new chips as a 3-5 year upgrade option for users still on Nehalem, Westmere and Sandy Bridge. This is ultimately where Intel believes most of the upgrade sales are coming from, rather than users jumping from Skylake. The other factor is the motherboard side of the equation. We know that Kaby Lake on the desktop is to be accompanied by a new chipset launch as well, the 200-series, and typically if we were expecting a September launch then we would have seen motherboard examples at Computex. At the show, only MSI had an ‘unlabeled 200-series’ motherboard on show, which looked pretty identical to a Z170 product already on sale barring the design ID. We don’t yet know the benefits of the 200-series chipset over the 100-series line, and a release date in January would mean that motherboard manufacturers should now be in the final design steps for their major SKUs. Saying ‘January’ as a launch date is quite vague. But, January has the annual CES event in Las Vegas during the first week after New Year, which is a common time to launch new CPUs after the holiday season finishes and people are ‘rested’. After all that, I’m pretty sure it’s pronounced Kay-bee Lake. Does any of the new fixed-function logic that is part of the GPU get to work when I use a discrete GPU instead of the integrated? I just messed about with NVENC, QSVEncC and x265 when ripping som DVDs. X265 still gives the best quality and size. With a i5-6500, the encoding speed wasn't all that, at around 65 fps. Of course, QSVEncC was closer to 200 fps and NVENC (GTX 1070) clocked in at 1300-2000 FPS.